Black Friday is so-called, the tale goes, because it was the first day of the financial year that businesses could expect to make a profit - for their ledger to go from red to black. The day after Thanksgiving, when the corporate world was off from work, was a ripe opportunity for the sales world to make a killing. I should know; I’ve worked in that sales world for over a decade. 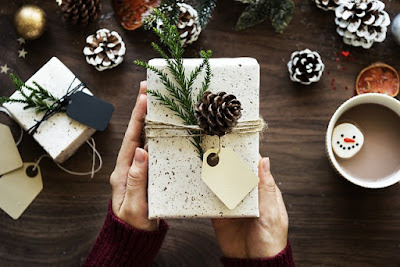 Yet for many, many businesses - particularly the smaller, independent variety - the holidays can be a period of desperate scrounging, dubious returns-on-investment, and dwindling sales as global corporations steal their thunder with razor-thin profit margins and revenue-to-overhead cost ratios that simply can’t be matched. Why would you pay list-price for a paperback novel when Amazon has the hardcover version for half the price? In my years in retail, I’ve had the (ironic) fortune to work for one of those major corporations, but one whose core values closely mirror my own. Despite the gargantuan size of the company for which I work, we continue to believe that small, local businesses are the future - because that’s where we came from. We actively reach out to our communities, partnering with small companies and independent businesses, helping them to thrive. One could ask why this is important at all. We live in a world where convenience is a commodity, and the digital world has made things terribly, terribly convenient; how easy it is to click a couple of buttons, and see our purchase on the doorstep the next day! No more malls, no more battling for the last item on the shelf, no more tedious pitches from commission-based salespeople. In many ways I agree; I find myself year after year doing my last-minute shopping online, taking advantage of that next-day delivery and those discounted prices, and the relief I feel, knowing that I don’t have to brave the cold on Christmas Eve, is more than worth it. But there’s a significant downside to this convenience, and it’s something I again align with my company on: it heralds an utter lack of passion and human connection. Think, for a moment, about your local bookstore. No, not Barnes & Noble; I mean the one on the high street of your nearest small town, the one run by a friendly couple who remember you even when you only visit twice a year. Ask yourself: why do they exist? Why would a person invest often their life savings - not to mention their time, blood, sweat and tears - into a venture that, in all likelihood, is going to fail? The answer is passion. It is love. It is caring, and a genuine desire to help real people in the small world they live in. It doesn't matter if the business is a bookstore or an ice cream parlor; at some point, someone felt deeply enough about a product to want to share it with others. Passion is life. It is the reason we get up every day. If I didn’t truly believe in the work I did - writing or otherwise - I’d have very little reason left to carry on. These people who chose to do their life’s work furthering their passion should be commended and supported - because deep down, they represent every one of us. I don’t own a business, although there is a business to writing and selling books. But if I did, I’d want it to be the best damn business of its kind. Because who wants to be number two? But these businesses, these people … they can’t succeed without the rest of us. Over the past three years, I’ve seen both of my local bookshops change hands, go out of business, and shut down. It deeply, deeply saddens me, because these were people I knew who truly wanted to share their passion for books with the world around them. So I made a commitment this year. I might not do all my shopping in person, but I’m going to try and avoid the ‘big’ names if I can. Not because they’re bad - even Amazon was a startup, once - but simply because they had the chance, and they proved themselves. I feel compassion for the smaller people who might just be getting going, and who need the break that the big guys once got themselves. So when my teenager asked for a copy of the Silmarillion, I decided to head over the nearest indie bookstore I could find and place the order through them. Same thing for the guitar strings, and whatnot. I could have done it myself; I could easily have cut out the middle person. But then I would have missed on the human interaction of speaking with someone who could not only help me get what I was looking for but who might have a recommendation or two. Someone who really understood why I was looking for it in the first place. Someone to share the passion. So share your passion this holiday season. Go out, spend a little more time, and get to know the people who make our world run. You’ll be surprised how friendly we are. And you might just get more than you were looking for; after all, we do what we do because we love it so much. Wonderful post! <3 I try to shop at local family owned businesses as much as possible.